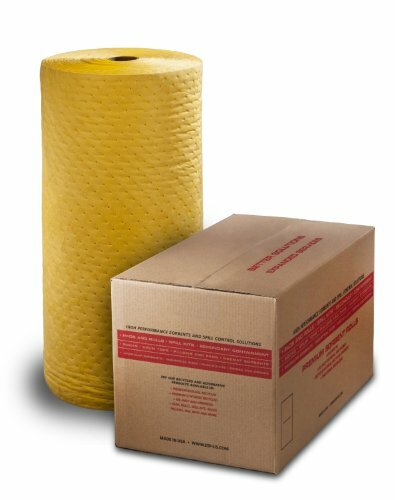 ESP Airmatrix heavy weight chemical hazmat absorbent laminated roll. This is the sustainable option to meltblown polypropylene as it is made from 85 percent recycled polypropylene and is generally more durable then meltblown. Always use an absorbent made from polypropylene when handling hazardous or unknown liquids. Bright yellow in color makes them easier to locate and warns that a hazardous liquid may be present. It also features a construction very similar to single sided meltblown. This combines the best features found in a laminated pad, (no lint and durable) while reducing the slip problem associated with double sided laminated sorbents. These features make this pad a great sustainable polypropylene product. Made from 85 percent recycled/sustainable polypropylene the sorbent is made up of two layers that are sonically welded together. Top layer is made of a yellow, no lint, durable spunbond polypropylene. Core/base layer is made from a combination of high loft meltblown fibers and no lint spunbond. Not as slippery as a fully laminated rolls. Base layer is low slip making this a great product for foot traffic. Low linting. Use to clean up a wide range of toxic, flammable, corrosive or aggressive liquids. Always use then there is a spill of unknown liquid. This roll is a great all round choice as there is virtually nothing that it can't handle. Fire retardant as per ASTM 726. Ensure that disposal of these sorbents complies with all local, state and federal regulations. Basis weight: 275 gsm. Absorbency: 42 gallons oil. Base fiber: polypropylene. If you have any questions about this product by ESP, contact us by completing and submitting the form below. If you are looking for a specif part number, please include it with your message.